Last season the Toronto Maple Leafs had some of the best goaltending depth in the NHL. Now, having lost Curtis McElhinney and Calvin Pickard to waivers at the start of the season, the Maple Leafs have quickly realized that they need help. With Frederik Andersen out with a day-to-day groin injury, it immediately shows how shallow their goaltending depth is. After Garret Sparks, the Maple Leafs have no NHL options if Andersen misses more games. The Toronto Marlies are having a terrible season compared to their Calder Cup-winning performance last season and part of the problem is goaltending. They had Sparks and Pickard last season, who were both fantastic, but of the four goalies who have played games this season, only one has a save percentage over .900 and that’s Michael Garteig, in one game. 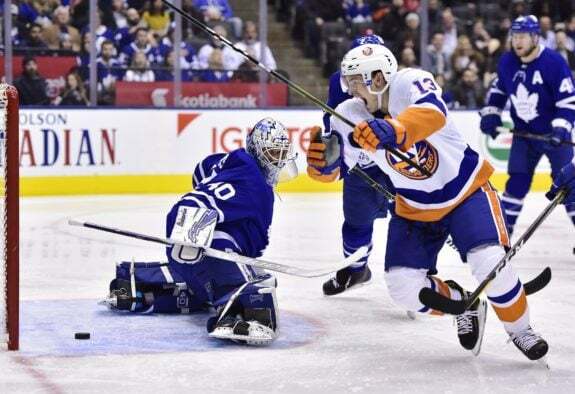 By acquiring Michael Hutchinson from the Florida Panthers, it gives the Maple Leafs some much-needed depth as he has experience in both the NHL and AHL. Although Andersen is listed as day-to-day with his injury, it does bring up the scenario that he could miss more time at another point in the season. It’s no secret that the Maple Leafs play him as much as possible as he is often the difference-maker in getting a win. But at some point, they need to think ahead to the playoffs. How far can Andersen take the Maple Leafs after he’s played over 60 games in the regular season? Andersen’s backup is Sparks, a polarizing goalie in his short time in the NHL with a 6-2-1 record, a 3.01 goals against average (GAA) and a .905 save percentage (SV%). He’s been great at times but has also let in four or more goals in five of his nine starts. Although he is still considered a rookie, the backup position isn’t one that gives a player time to adjust. Finding a backup goalie isn’t hard in the NHL, the problem is finding one who can play well while hardly getting ice time with how Mike Babcock uses the Leafs’ backup. Hutchinson gives the team a goalie with NHL experience who can come in if Andersen is injured or if Sparks’ play becomes an issue. To say that the Marlies’ goaltending has been bad this season would be an understatement. Eamon McAdam has played the bulk of games with a record of 7-4-3, a 2.99 GAA and an .891 SV%. Then there was Jeff Glass who was traded away and had a terrible .849 SV% through 10 games as well as Kasimir Kaskisuo who had an equally-awful .866 SV% through 11 games. Although Hutchinson hasn’t been amazing this season, he will still be a drastic improvement over the Marlies’ current options. 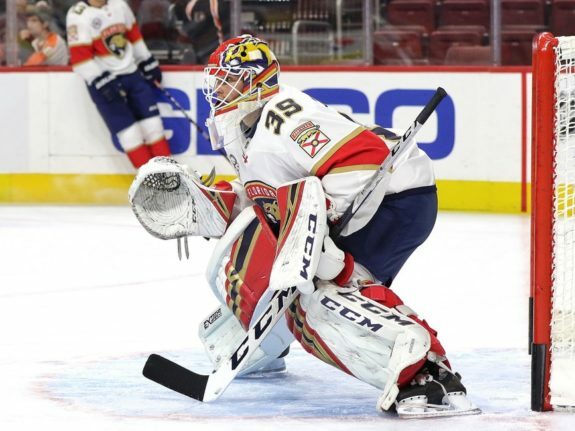 At the NHL level, Hutchinson has been mediocre with his .839 SV% in four games with the Panthers, but this season is an outlier compared to how he’s usually performed. And that’s about the same for his time in the AHL with a .906 SV% in eight games with the Springfield Thunderbirds. If Hutchinson can at least give the Marlies average goaltending, it will drastically change the team’s season outlook. The Marlies are ninth in the league in goals scored but have also allowed the fifth-most goals, so it’s obvious where the problem lies. Hutchinson may not be the best goalie, but he gives the Maple Leafs an option besides Sparks and can be a serviceable goalie in the AHL to help get the Marlies’ season back on track.